Chestnuts have always been one of the most popular holiday treats. However, today few people seem to know how to prepare them. What you need is a high, intense heat to cook the chestnuts to make them sweet and wonderful. Chances are you have the perfect piece of cooking equipment sitting on your patio—your grill. Whether it's gas or charcoal, it will provide the kind of heat needed to cook chestnuts to perfection. The first thing you need to do is make sure you inspect the chestnuts and throw out any that are cracked, moldy, or make a rattling sound when shaken. If the meat is dried out, the chestnuts will rattle with a hard sound like there is a marble inside. These are no good and should be tossed. Before the chestnuts hit the grill, give them a good rinse. This will reduce the charring on the surface as they roast, and help soften the shells for later on when it is time to peel the nuts. It also washes off any remaining dirt and dust. Lightly dry the chestnuts with a paper towel. Next, you need to cut the chestnuts. You might have heard of chestnuts popping on an open fire, but, actually, you don't want them popping too much. To keep them from literally exploding, cut a little X in the shell of the chestnut to let out the steam as they cook. This is easily done by pushing the point of a paring knife through the shell anywhere on the nut. Preheat your grill to 400 F. If the chestnuts can fall through the cooking grate, place them in a grill basket, grill wok, or in a pie tin with holes punched into the bottom. Otherwise, place the chestnuts directly on the cooking grate. The cooking time is roughly 15 minutes but watch them carefully to prevent burning. Chestnuts should be turned or tossed around on the grill every 5 minutes so that they cook evenly and the shells do not burn excessively. This process works the same on both gas and charcoal grills. Just watch the temperature to keep it as close to 400 F as possible. After about 15 minutes, the chestnuts should be cooked. Remember that underdone chestnuts taste bitter, but when properly cooked, they have a slightly sweet, buttery flavor. The chestnuts are done when the shells have a little charring on the surface and the X you made is opened up, allowing you to see the meat of the chestnut inside. 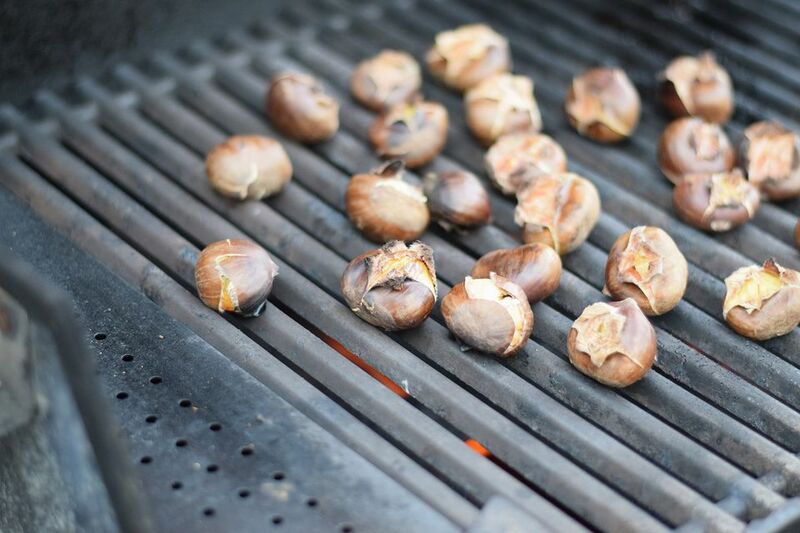 When done, remove the chestnuts from the grill and allow to cool to the point where you can handle them comfortably. Once the chestnuts have cooled down sufficiently, it is time to get them out of their shells. Don't let them cool down too much since chestnuts are best served warm. The shells of the chestnuts should be hard and easily broken. Using the cut X, pull open the shells and remove the meat. These nuts are delicious eaten straight from the shell or perfect in any number of dishes, including stuffings, soups, and puddings.